The Book of Mormon is a sacred volume of scripture, a second testament and witness of Jesus Christ, the Redeemer of the world. The record was translated from reformed Egyptian into English through "the gift and power of God." The exact process by which that power was manifest through Joseph Smith is only fully known to the Lord and the prophet. Joseph once said that "it was not intended to tell the world all the particulars of the coming forth of the Book of Mormon" (History of the Church 1:220), so many of those particulars are unknown. However, from the accounts of others, including his wife, Emma Hale Smith, Oliver Cowdery, and Martin Harris, all of whom acted as scribes during the translation, the miraculous nature of that process is documented and preserved. Joseph Smith first learned about the existence of The Golden Plates from the angel Moroni in 1823. For the next four years he was not allowed to obtain the plates, although he visited the spot where they were buried yearly and met the angel, receiving instruction from him. In 1827 he was sufficiently prepared to be entrusted with the golden plates. Buried with the plates were other artifacts, including the Urim and Thummim, the device by which he began the translation. Joseph also possessed a seer stone, and both these instruments were used to translate. There are several helpful accounts of the method by which the translation took place. One account describes Joseph attaching the breastplate of the Urim and Thummim and looking directly at the plates through the two stones set in a silver bow. The other widely-recorded method includes Joseph's placing his seer stone in a hat and placing his face in the hat to block out all light. The plates were left covered when using this method. Each scribe reported Joseph dictating one sentence at a time, spelling out words or names. The scribe would then read the sentence back to Joseph to confirm its correctness. 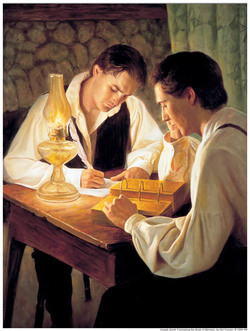 Mormon Church leaders and scholars have often stated that the Book of Mormon translation was not a mechanical process; it involved great mental and spiritual concentration on the part of Joseph Smith. At the completion of the translation, the golden plates were returned to the angel Moroni, in whose care they remain to this day. The resulting translation was published as the Book of Mormon in 1830. Since then it has been translated by linguists into 72 other languages, and over 120 million copies have been distributed worldwide. This page was last edited on 11 November 2011, at 00:53.